Automatic liquid line machine s consists of Turn Table, magnifying glass, filling machine, capping machine, & labeling machine. Rotary Bottle washing machine use to clean Glass and pet bottles internally & externally with help of Jet wash. Widely use to pack free flowing liquid like –Shampoo, Hair Oil, Pharma Syrup, Phenyl etc. with the help of volumetric syringe base mechanism. Servo Base Auger filling machine highly use for packing Non Free Flow Powder line-Talcum powder, Cocoa powder. Automatic Linear Capping Machine is use to tight the bottle use in industries such as, Perfume, Pharma, Cosmetics etc. Automatic Sticker (Self-Adhesive) Labeling Machine, Suitable to apply accurate Labels on Flat / Oval / Square shaped products having PET, Plastic, HDPE, LDPE, Glass or any other surface. Printer is use to print to batch number, manufacturing date, Expiry date, MRP on the labels with the help of cartridge. Packing Conveyor is use to pack finish product in to the shipper boxes manually. The machine is a stand-alone mechanical machine capable of filling viscous/highly viscous fluids/pasty materials without solid matters in hot or cold conditions like Lassi, Ketchup, Cheese [hot], yogurt, honey, jams [hot], paints, oils, Facial Creams, adhesives etc. 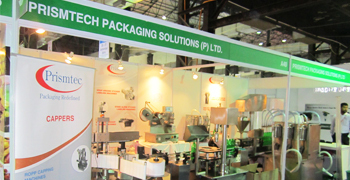 Automatic Form Fill & Seal Machine use to pack free flowing liquid like –Shampoo, Hair Oil, etc.